Jonathon Callicoat launched Hops21 in Liberty a year ago with plans to expand into medical marijuana when it becomes legal. LIBERTY, Mo. — Deep inside a cave off Route 210, you'll find an unconventional farm with ties to an issue on the ballot next month. On Thursday nights, Jonathon Callicoat is at the whiteboard there, lecturing to a group of students. He teaches high-level biology and chemistry, but the subject also requires a green thumb. "I've killed every plant I've ever owned except for the four I have alive in the other room," said Nancy Koch, one of the students. She was referring to a well-lit room filled with bright green hops plants. Callicoat and his father, Dr. Paul Callicoat, launched Hops21 about a year ago. They use the facility as a learning center for those interested in cultivating a different, but very similar plant. 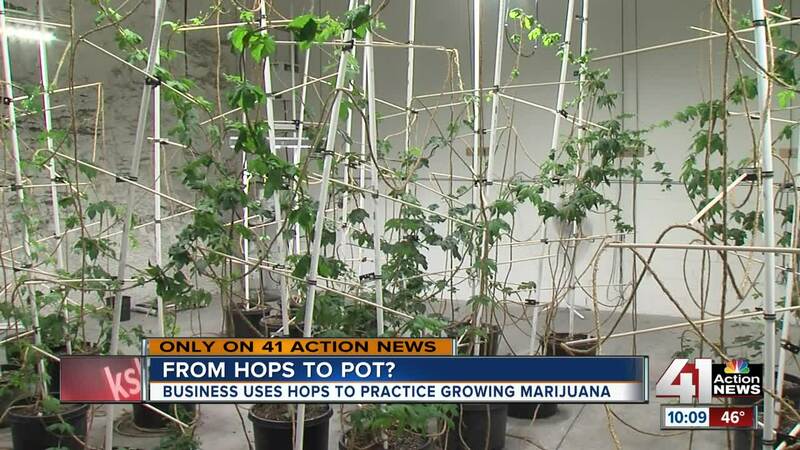 "It's uncanny really how much the hops plant resembles marijuana," Jonathon Callicoat said. After spending several years working in genetics labs, he moved out to Washington state, where he learned how to cultivate marijuana. When he returned to Missouri, he came across a hops plant while out on a landscaping job. "I traveled all the way across the country to cultivate marijuana, and low and behold, one of the most commonly used flowers in the nation is perfectly legal and there waiting for me to cultivate," he said. That's how he came up with the idea to practice with hops until medical marijuana becomes legal in the state. Callicoat pitched the idea to his father. "I said, 'Okay, we'll give it a shot,'" Dr. Callicoat said. The father-son duo quickly realized their operation wasn't big enough for distribution, so they pivoted to education and preparation for marijuana. "The ability to use hops in lieu of marijuana in preparation for marijuana so we can dial in things like standard operating procedures has been a huge advantage to us," Jonathon Callicoat said. The Callicoats are involved with New Approach Missouri, the campaign for Amendment 2. It would tax marijuana sales at 4 percent, with proceeds going to veterans health care programs. They already bought a nursery in southwest Missouri, where they hope to set up shop if Amendment 2 passes. "We'll be able to expand fuller, quicker in a more traditional-type grow," said Dr. Callicoat. There are three medical marijuana measures on the ballot on November 6. You can read more about them here.